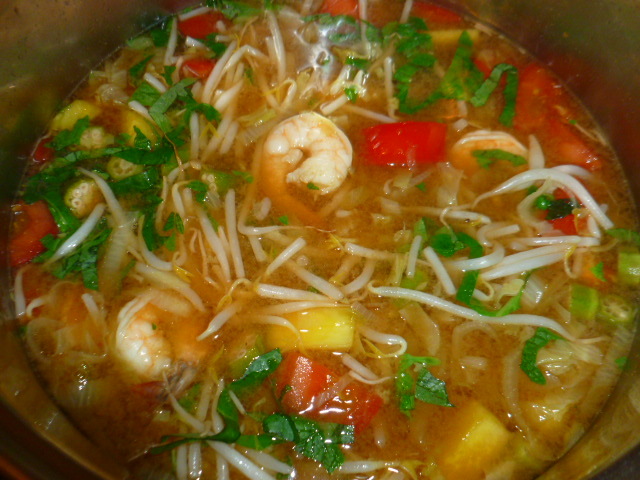 I had variations of sweet and sour shrimps and pineapple soup in several Vietnamese restaurants, some were good, others less so. 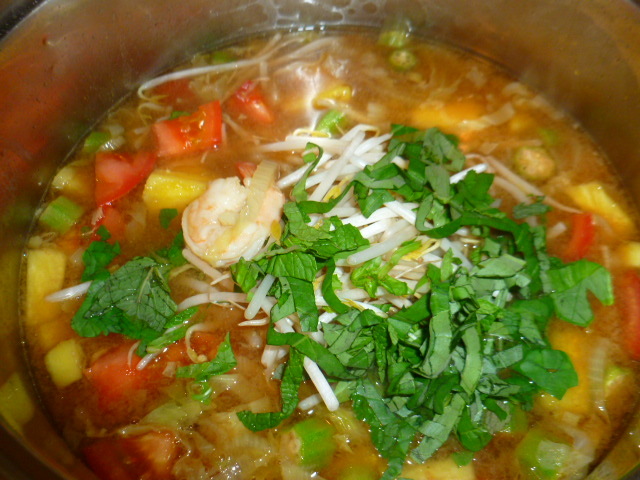 Yet, even with the lesser ones, I always liked the combination of flavors of the shrimps, pineapple, okra and hardly cooked tomatoes, and I decided to make this soup at home. As I checked some traditional recipes, I realized that gathering the authentic ingredients will be hard, as certain greens and herbs are not available in most stores, or even in Asian markets. So, I was set on making my own version of the soup, and the result is in front of you. This is by no means an authentic recipe, but I liked the result enough to write it down, and already made it twice. 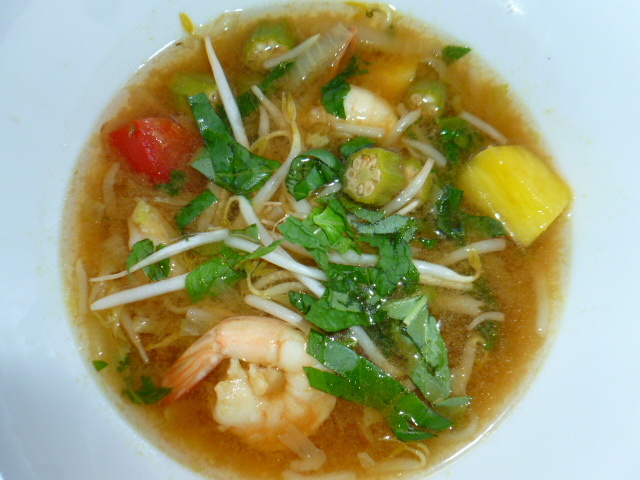 The soup is fresh, light and flavorful, with sweet and sour tones, and layers of flavors and textures. It is perfect for the season, when it’s still a bit chilly, yet already too warm to have a hearty, heavy soup. Try it and enjoy. 1. 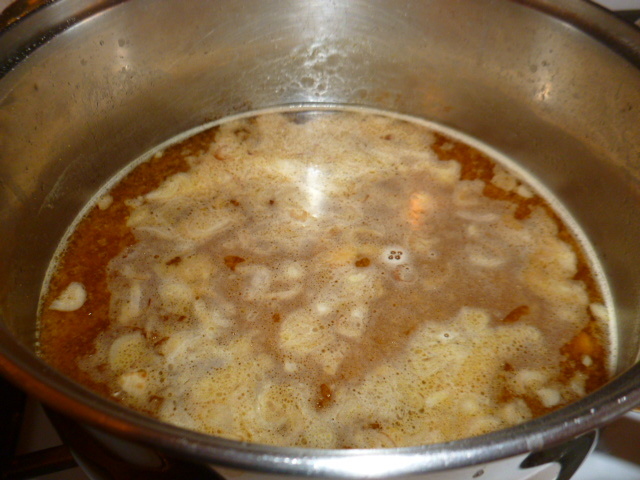 Heat the oil in a large pot over medium-high heat. 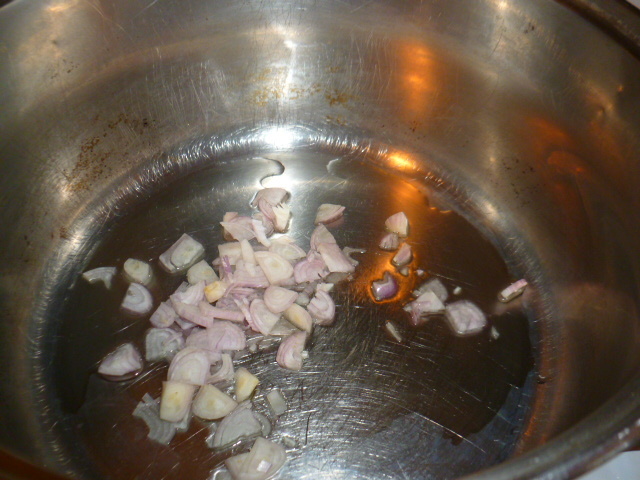 Add the shallots and fry for a minute. 2. 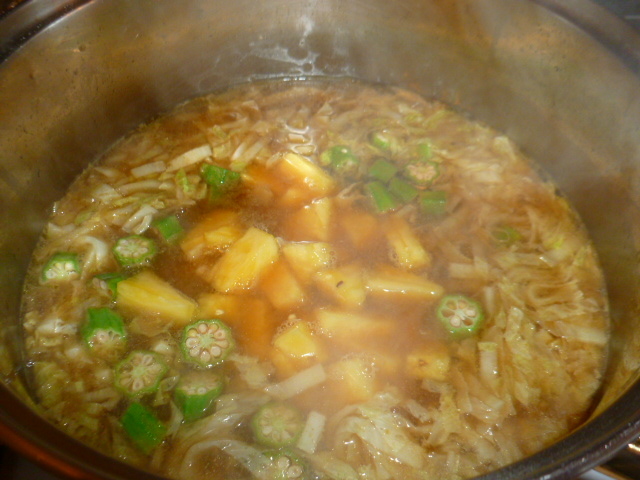 Add the stock, curry paste, soy sauce, fish sauce, tamarind paste, vinegar, lime juice, sugar, date syrup, water, salt and hot sauce, if using. 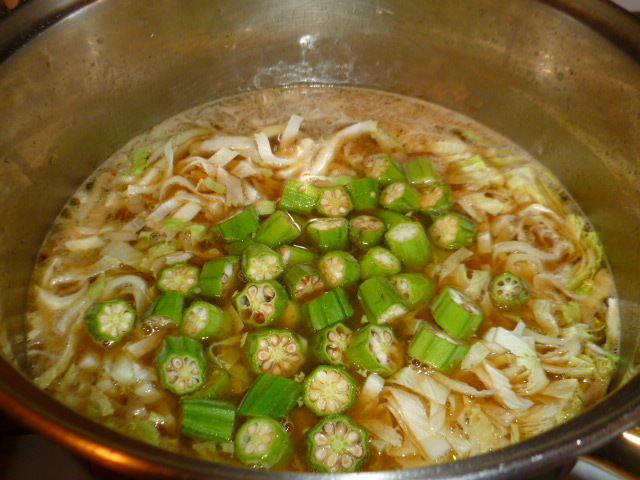 Mix and bring to an almost boil. 3. 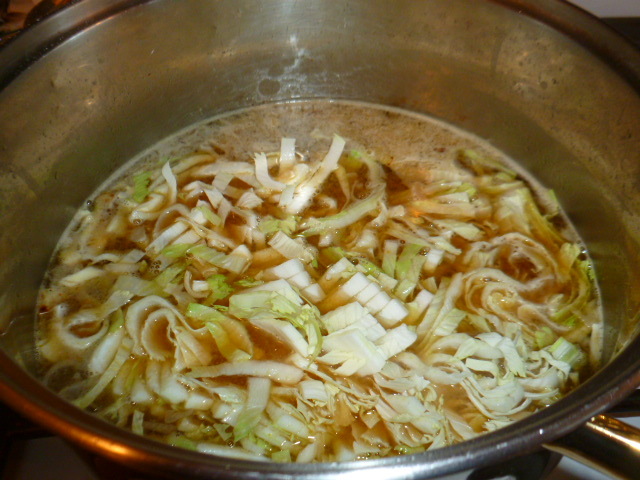 Add the cabbage, mix and cook for 2-3 minutes. 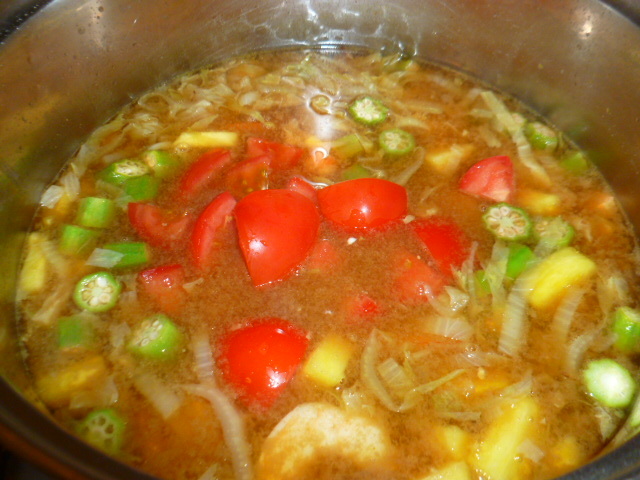 Add the okra and pineapple, mix and cook for a minute. 4. 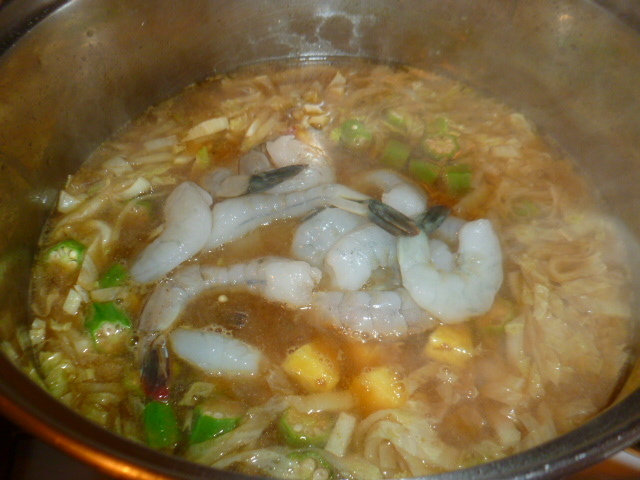 Add the shrimps, and cook for 2 minutes, until they changes color. Add the tomatoes, cook for a minute and take off the heat. Taste and adjust seasoning if needed. 5. 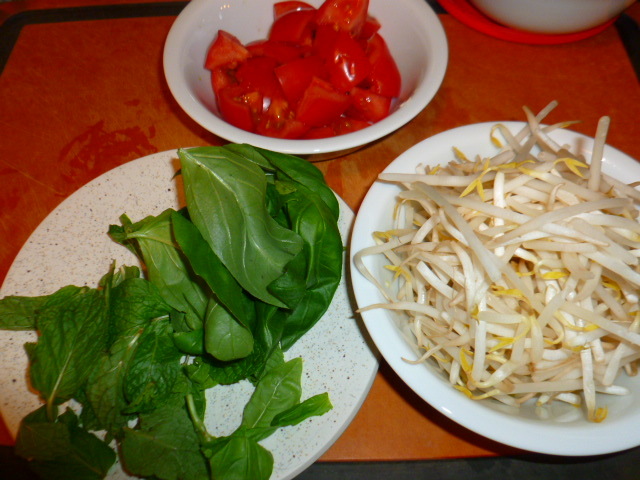 Add the bean sprouts and fresh herbs, mix and serve. We’ve been on a stir fry kick lately, and this fits right in. I don’t know why I stopped sprouting – it is easy and convenient. I still have all the equipment, which amounts to just a set of screw tops with different-sized holes, and a couple of quart-sized Mason/Bell jars. The tops just make it a cakewalk to rinse and drain. Very, very easy. Ronit, this looks, sounds and I’m sure tastes great. I love okra, so you had me there, but add in the other ingredients and it must be amazing. Thanks for keeping the ingredients simple and will be giving this one a go very soon. Yes please – I love Vietnamese food! Yes, what’s not to like 😉 Unfortunately it’s not so easy to get hold of around here, so will have to make my own. Kudos to you for preparing your own version of what amounts to Vietnamese prawn (shrimp) pho in all of Australasia. Quite a popular dish hereabouts but your version does miss both the cinnamon and anise methinks rather necessary to make this taste ‘right’ :) ! .I know pineapple is sometimes used . . . personally it does disturb my palate but that is just my preference . . . .but over the past few years Vietnamese has overtaken Malaysian, Nonya and Szechwan as my favourite in the area and I cook SE Asian 4-5 times a week . . . happy cooking ! Thank you for your comment, Eha. Both cinnamon or anise have a very pronounced aroma, so no doubt I would detect them in the soups I’ve tasted. Both also are not mentioned in any of the authentic recipe I’ve found. It could be a regional thing. Quite true! 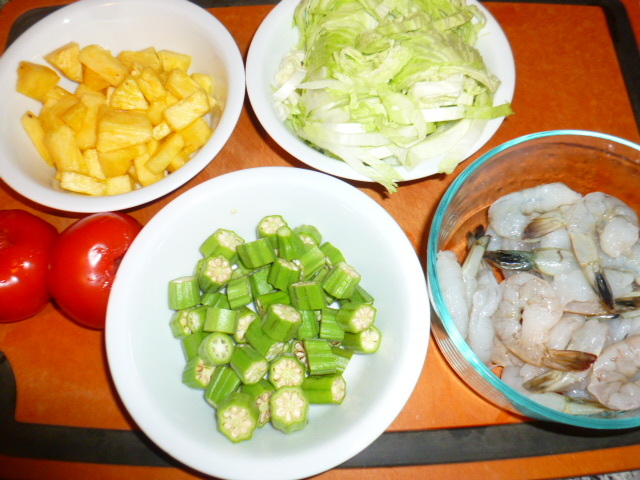 From long experience as far as almost any Asian cooking is concerned quite considerable differences seem to exist twixt the Australasian and Stateside way of presenting various dishes. I have studied and do cook classic Asian as much as I can. Easy here as over 70% of food bloggers have an Asian background and, even in country supermarkets, one can buy everything necessary . . .and methinks most of us have our own herb gardens from which to gather . . . I have never needed to visit an ‘Asian’ store . . . I wonder if I could replicate it with fake shrimp – worth a try, I think. I do my own sprouting, and without any special equipment, but first soaking beans overnight in a jar and then hanging them in a cheesecloth bag. Pretty easy to rinse and dry, and they are usually ready in a couple of days with little tails, 4 – 5 days for real long sprouts. Thank you Dolly, for your comment and for the tips on sprouting! I hope to try it soon. Thank you so much, Ronit; I will try it both ways, with fake shrimp and with snapper. I’ll let you know, thank you. Ronit, This soup looks amazing and perfect for the season. I have not had this soup in the restaurant but love your version and will definitely try it- all my favorite flavors are in this soup! wow mouthwatering soup, love this dish! Looks appealing and tasty. Thanks for sharing. I really like how you came up with a recipe that kept the Vietnamese essence, yet uses readily available ingredients. So often when I look at recipes they call for ingredients that I think I’ll have difficulty finding so I don’t make them. Oh my! This looks so damn good!!! Any dish with shrimp is my favourite!